Sandcat allows web administrators to perform aggressive and comprehensive scans of an organization’s web server to isolate vulnerabilities and identify security holes. 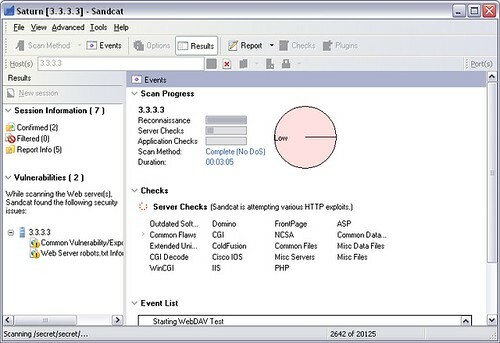 The Sandcat scanner requires basic inputs such as host names, start URLs and port numbers to scan a complete web site and test all the web applications for security vulnerabilities. This is a pretty nifty and complete tool, there is a ‘pro’ version available too. Any stats on the accuracy of this tool.. I tried this tool on 2 different php websites last night. Both are highly vulnerable to XSS & SQL Injection atacks (I know for sure as i developed these websites for testing purposes).. Although this tool correctly found the web server information but reported 0 XSS vulnerabilities and 0 sql injection vulnerabilities. Please let me know if anyone else found it more useful. Has anyone else had chance to try it out and verify it’s reliability?